A NASA Astronaut who carried a flag bearing the logo of the National Radio Astronomy Observatory (NRAO) on last month's Shuttle flight returned that flag to the observatory on Friday, April 12, at a ceremony in Socorro. Dr. John M. Grunsfeld, payload commander of the STS-109 flight, also addressed students at the New Mexico State Science Fair on Saturday, April 13, on the campus of New Mexico Tech in Socorro. 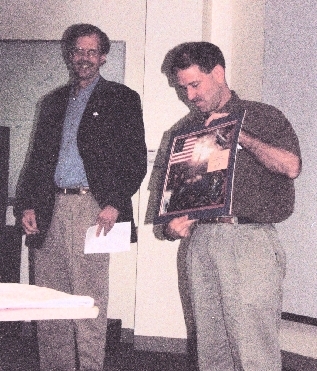 Grunsfeld, an astronomer who observed with NRAO's Very Large Array (VLA) radio telescope in 1991, carried the 3-by-5-foot NRAO flag aboard Columbia during the March 1-12 mission to service the Hubble Space Telescope. 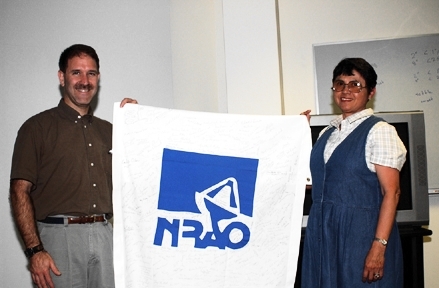 The NRAO flag, made by Socorro resident Dora Spargo, had been sent to the observatory's facilities in Socorro; Tucson, AZ; Green Bank, WV; and Charlottesville, VA, where NRAO employees signed it prior to the flight. "With our signatures on that flag, we all felt like we were riding along with John aboard the Shuttle," said NRAO Director Paul Vanden Bout. "We are proud that NRAO was represented on a mission that was so important to astronomy," Vanden Bout added. During the flight, Grunsfeld performed three of the five spacewalks in which crew members successfully upgraded the Hubble Space Telescope. The astronauts left the space observatory with a new power unit, a new camera and new solar arrays. The upgrades, said Grunsfeld, leave the orbiting telescope with "its discovery potential significantly increased." STS-109 was Grunsfeld's fourth space flight and his second visit to Hubble. 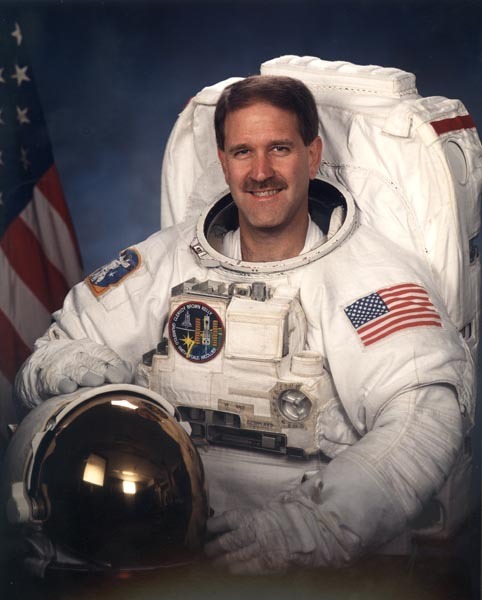 A research astronomer who received his bachelor's degree in physics from MIT and a Ph.D from the University of Chicago in 1988, Grunsfeld was selected to the astronaut corps in 1992. His first space flight, in 1995, featured astronomical observations using the Astro observatory, a three-telescope facility aboard the Shuttle Endeavour. In 1997, Grunsfeld rode Atlantis on a 10-day mission to the Russian space station Mir. In 1999, he performed two space walks during a Discovery mission to install new instruments on Hubble. In 1991, while a senior research fellow at Caltech, Grunsfeld was the principal investigator for a series of VLA observations of a gamma-ray-emitting object, conducted at the same time the object was observed by the orbiting Compton Gamma Ray Observatory. "I still think fondly of my observations at the VLA," said Grunsfeld. 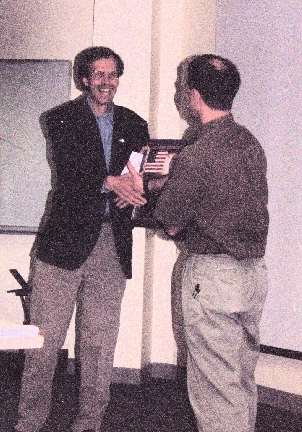 During his visit to New Mexico, Grunsfeld formally presented the NRAO flag to the observatory, along with documentation of its flight aboard Columbia. He also addressed the awards ceremonies of the New Mexico State Science Fair. "We are particularly pleased that John's visit allowed him to speak to the science fair students," said Jim Ulvestad, NRAO's Assistant Director for New Mexico operations. "Those students heard from someone whose science training has literally taken him beyond the Earth," Ulvestad said. John Grunsfeld and Dora Spargo, maker of the flag. 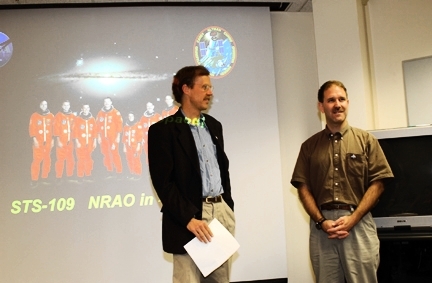 Grunsfeld and Jim Ulvestad, NRAO Assistant Director for NM Operations. Grunsfeld Presents Certificate to Ulvestad. 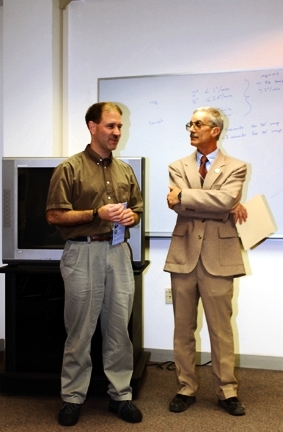 Grunsfeld and Dave Finley, NRAO Public Information Officer. Crowd in the AOC auditorium listens to Grunsfeld.